A large majority of those who visit Roatan do so for the diving. With the island bearing the second largest reef in the world, it is no wonder that people from all over the globe come to experience life under the Caribbean sea. 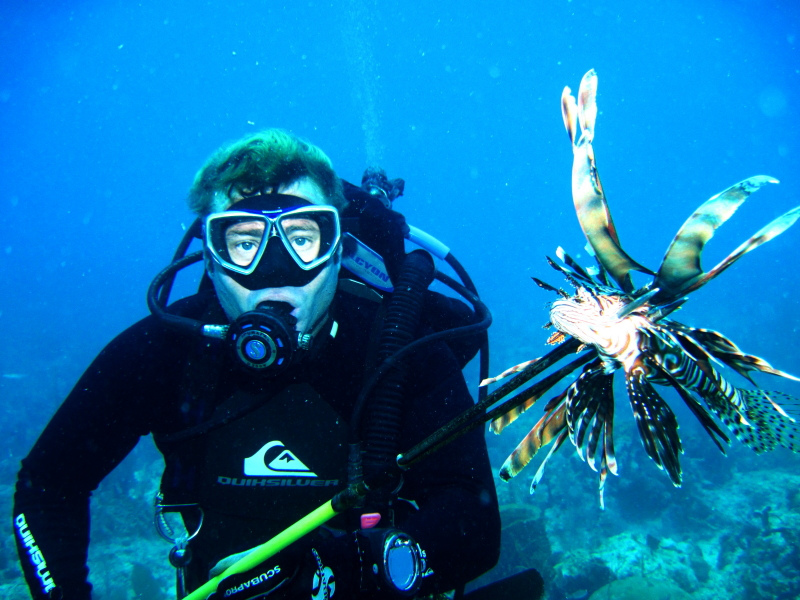 In Roatan, divers are legally allowed to spear lionfish due to their negative impact on the ecosystem. 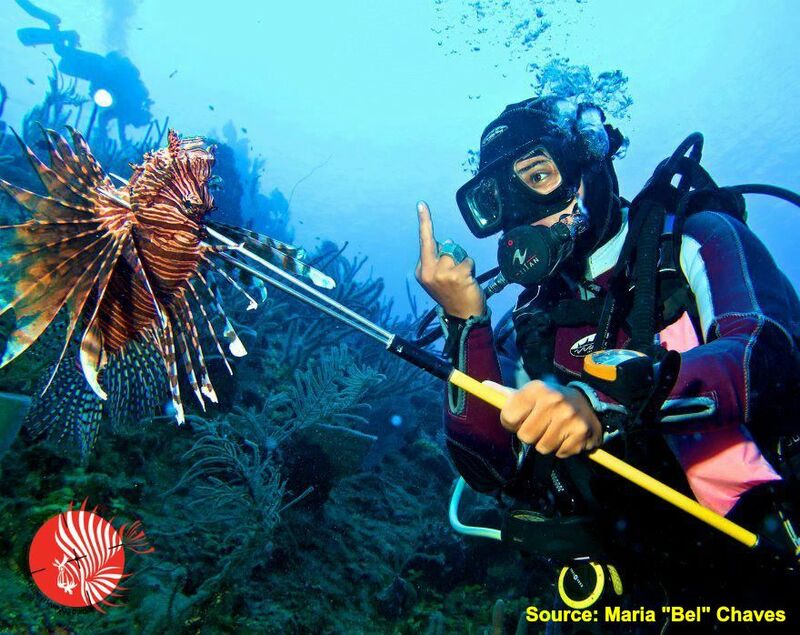 There are some regulations such as each diver needs to get his or her own registered and initialed spear, but essentially, everyone wants the lionfish dead. Roatan is very adamant at preserving its ecosystem and normally, the main purpose of preservation is to keep humans out of the mix and let life be. But somehow, the lionfish epidemic has pierced this eco rule and humans seem to be the only hope for the marine life invaded by the lionfish. What makes a lionfish so utterly obnoxious is its enormous appetite – its stomach can expand up to 30 times its normal size after a meal. The lionfish’s favorite delicacy’s include smaller fish and shrimp as the lionfish is relatively small itself, reaching an average of 12 to 19 inches in length. Naturally, with the lionfish’s compulsive eating habits, the quantities of snapper and grouper for sale have significantly been reduced. 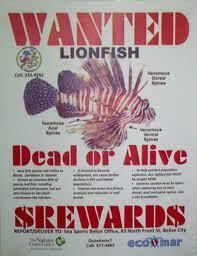 But in reality, lionfish will eat anything and just won’t stop. More alarmingly, a single lionfish was found to reduce a native species’ population by 79% in five weeks. “It seems that the native fish don’t perceive lionfish as fish,” Mark Hixon, a marine biologist at Oregon State University said, pointing to the fish’s markings. “They swim right up to it,” only to end up being swallowed whole.” Studies have also found that the lionfish is eating so much that it is actually causing itself liver damage! As far as containing the problem, the lionfish reproduces so quickly that almost nothing can be done to contain the problem. One female lionfish produces 30,000 to 40,000 eggs every few days, and become sexually mature by the age of one.Therefore, on average, one lionfish female produces 2,000,000 eggs per year. The average lifespan of a lionfish is 18-20 years. Therefore, one lionfish female produces 2,000,000 eggs per year. That means that one female will produce 38,000,000 eggs in her lifetime. All of the billions of the lionfish swimming in the Atlantic Ocean are derived from just six species of lionfsh females. Pet owners in Florida have reportedly been blamed for releasing the fish into unfamiliar waters. It may be hard to fathom but DNA evidence has traced all lionfish in the Atlantic back to between six to eight female lionfish, according to CNN. Well, when one female can produce 38,000,000 eggs in a lifetime, six female lionfish would be responsible for an initial batch of 228,000,000 eggs! Thus, it is understandably reasonable to fathom how the lionfish population has grown so fast in a relatively short period of time. 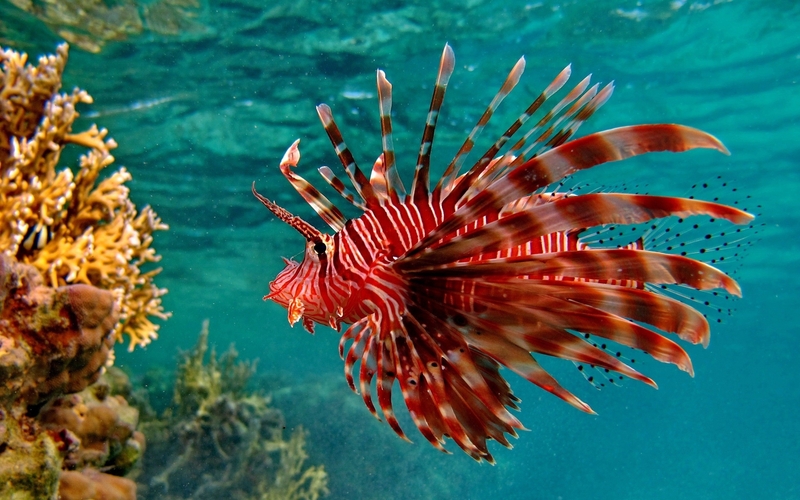 Last spring, the U.S. Food and Drug Administration issued draft guidance warning that two lionfish species, Pterois volitans and Pterois miles, carry a danger of ciguatera fish poisoning (CFP) for consumers. According to a 2012 NBC News report, 50,000 cases of ciguatera poisoning are reported each year, but experts say the real number of cases may be 100 times higher. However, as of July 2013, the FDA admitted there have been no known reports of CFP illnesses associated with the consumption of lionfish. Yet, the FDA continues to warn of the risk of eating lionfish, but leaves it up to primary seafood processors to ensure that the fish they distribute are safe, which involves knowing that the fish do not come from affected harvest locations. This is attributable to the lionfish’s venom located in its frilly spines. The lionfish spines are used as a defense mechanism and not offensively, but lionfish stings can be quite painful and can lead to serious infections. But when the spines are removed and any left over venom is fully cooked, it is apparently harmless for its consumers. By most reports, the lionfish makes for a quite delicious and healthy meal. Grouper can swallow a lionfish whole and are being used to combat the lionfish population. However, “If we want groupers to help us control the lionfish invasion we’ll have to develop a taste for lionfish instead of grouper and drastically reduce the fishing of this species.” Exactly. All things must go in cycles. If we as humans continue to catch grouper and not lionfish, how do we anticipate that the natural predator to these invaders will have the numbers to fight back? We would be no different than the lionfish if we had this attitude that we can continue in our ways and expect different results. The goal here is to rise above the lionfish in order to start winning battles to regain the win! The lionfish have already won the war. Now, it’s up to mankind to begin a new war and conquer battle by battle, area to area. The lionfish’s dark enemy will be the major corporation savant who realizes that they can catch an abundance of these lionfish and start exporting them for profit. Diving escapades that kill a measly 167 lionfish are not even scratching the surface of the problem, but don’t forget that lionfish is very tasty and can be used to make a seafood corporation even richer – perhaps, there is even a grant or tax right-off considering the harmful effects these predators pose if not controlled! As humans tend to focus on what they don’t have rather than what is right in front of them, the reality is that there is a huge plethora of lionfish for consumption. Yes, the lionfish has reduced the fish population by their compulsive eating habits, but in their defense, fish seem to swim right up to their face and admire their beauty without associating the lionfish as dangerous. Eventually these species will adapt to survive. Humans are the lionfish’s biggest predator because one thing is for sure: when the lionfish takes too much and starts reducing what mankind wants out of the deep blue sea: mankind attacks. I would except to see more and more lionfish dishes added to menu’s – mark my words, if you see grouper on the menu and have a liking for it – order it now because eventually the lionfish will replace many other fish on the menu! The ecosystem will survive as it always has, but it may not be the same and some species of fish may die or evolve as a result of the lionfish. But it is us who has to learn to evolve, first and foremost, and begin developing taste buds for the lionfish. That is all there is to it. One source says it best: “Lionfish may be one of the ocean’s most voracious predators, but on land, Homo sapiens might have it beat.” I must disagree – there is no ‘might have it beat’, in this case, homo sapiens must take action! Categories: Uncategorized | Tags: lionfish, lionfish invasion, Roatan, roatan scuba diving, spearing lionfish, Things to do in Roatan | Permalink.